I didn’t get to read much of Drunvalo’s book during my recent trip to New Zealand but managed to get through a large chunk of it during the return flight home. What a magical book it is, full of stories of synchronicity and psychic insights while underlying the significance of transforming the energetics of the planet during this progression into Unity Consciousness. But whether it’s on the global scale of Drunvalo’s work or just within the context of the local neighbourhood, all the work we do in raising our own vibration or helping others to clear, heal and raise their own, benefits the process. We are all in this together and it’s happening around us whether we are aware of it or not. Whether we believe in it or not. But it’s when we do become conscious of the energy around us that the true magic of spiritual happenings begin to appear. I remember on my first visit to NZ several years ago having several experiences that really started to make me wonder. One was when I was driving up the east coast of the South Island. I was following a truck and had just moved out across the lanes to overtake it when a large rock, golf ball size, came flying out from under its wheels and was headed straight for my face. I remember taking my hands off the steering wheel in fright and crossing them in front of me to protect myself, expecting the windscreen to smash, but somehow the rock bounced right off the glass and disappeared. I was shaken up (especially because I hadn’t taken out the additional hire car insurance!) but when I pulled over there wasn’t a crack, chip or even a scratch on the window. I couldn’t even tell where the rock had hit and I was forever grateful for whoever was protecting me that day. In another instance a few days later I had a spare day while at the top of the South Island and was playing with a crystal pendulum over a map to decide where I should go for a day trip. My mind had chosen a particular place I thought sounded interesting but the pendulum kept pointing to a different place. So I took the advice of the crystal and travelled to this other seaside town and when I got there I found a small curved beach with a headland point at one end with a small island just beyond it. But when I walked to the opposite end of the beach and climbed the steps up to a viewing platform, I remember losing my breath a little as I suddenly felt the distinct odd feeling of already knowing this place as the view from the platform was one that had appeared in a dream some weeks earlier. This recent trip to NZ has brought about a different kind of magic. The magic of tuning into the spirit of the land. Of communicating with Gaia. The natural beauty of NZ is obvious to anyone who visits yet the subtle energies residing within the natural landscape may be missed by some. I always feel a strong connection to the land in NZ but this trip came with a special purpose and in reaching out energetically to the places I visited I quickly became aware that the subtle energies weren’t so subtle. They pulled at me everywhere I went and so it was no surprise to read that the Maori name for Bridal Veil Falls, the very last sacred place I visited, is Waireinga, meaning leaping spirits. The native forest leading into these falls is rich with beautiful energies and after the incredible sight of the 55m waterfall I was walking out feeling humbled and grateful for such a beautiful end to an amazing journey. In extending my gratitude out to the land as I walked, I felt the urge to place my palms on each tree trunk and as I did so, each tree revealed its own face to me. 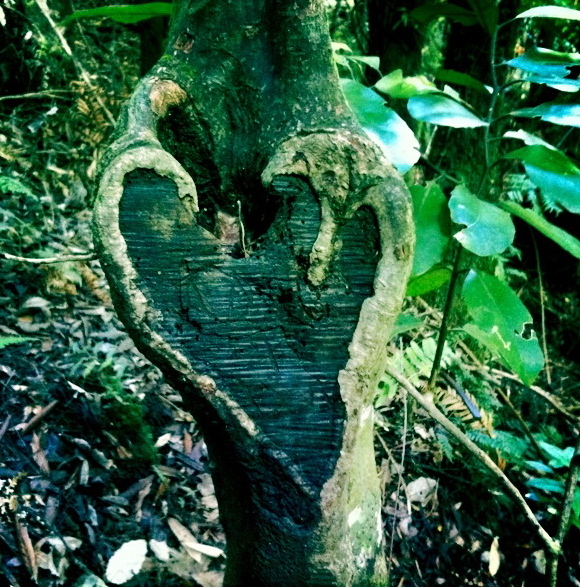 They say the forest is believed to be spiritually occupied by Patupaiarehe (Maori fairies) who are kaitiaki (guardians) of the area and if so, they provided me with a wonderful gift of a tree heart right at the end of the path. True, it was there for all to see but of all the people visiting the falls that day, not one stopped to notice. When I woke early on the morning I was flying out, I came out of a dream with a strong vision of my energy curved around the ball of the Earth that was NZ, connected to it by a cord of Light extending out from my Solar Plexus. A fitting end to an inspired journey and a clear message that I am sure to be returning again soon.